“All Horses Jump, No Chipped Paint” – Is This Your Sunday School Motto? I have a miniature carousel horse that sits on my desk at the office. It is a constant reminder of a story I once heard about Walt Disney. Walt loved carnival rides as a child. His favorite one was the carousel. He reflected on an experience he had as a very young man that, unknown to him at the moment, would change his life (and probably make a big impact on yours, too). He had waited in line to ride the carousel one night, amazed at the swirling of colors and light against the dark night sky. He could hardly wait to take his turn and ride the carousel! He gave the attendant his ticket and quickly mounted one of the carousel horses. 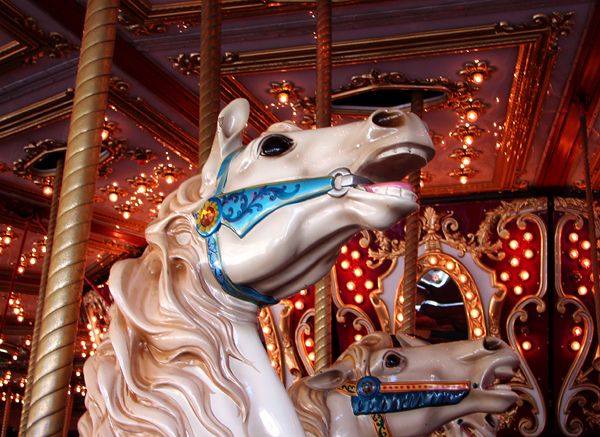 The carousel began to turn slowly at first, then it picked up speed. To Walt Disney’s dismay, he had picked a horse that was broken. The horse didn’t “jump” like the rest of the horses. He was very disappointed. If that wasn’t enough, he took a good look at the horse and realized that the paint had become chipped in many places; some people had even carved their initials into it. This was not the experience he had hoped for…and it certainly wasn’t the experience he’d payed for. Little did Walt Disney know it, but this experience would be the catalyst for his dream of a magical theme park where excellence would reign. Walt’s motto for DisneyLand became “All horses jump, no chipped paint,” and was a challenge to each and every employee to create an experience for guests that was nothing short of excellent. No disappointments…no letdowns…just amazing, quality experiences day after day, week after week, year after year for his guests. What does Walt’s “All horses jump, no chipped paint” motto have to do with your Sunday School? Everything. In his class book The Frog in the Kettle, George Barna noted that “Local churches must take a hard look at their performance and dedicate themselves to excellence in all they do. In today’s marketplace, people are critical and unforgiving. They have high expectations, and they give an organization only one chance to impress. In this type of environment, a church would be better off doing a few things with excellence rather than many things merely adequately.” Thom Rainer noted something similar in his book Breakout Churches: “The breakout churches were not churches of excellence in every conceivable area. They chose the areas in which they could be excellent and did not attempt to do everything else” (p.134). In Ken Hemphill’s classic book on Sunday School, Revitalizing the Sunday Morning Dinosaur, he also noted that plateaued churches managed to break out of their flatline growth pattern by placing a renewed emphasis on their Sunday School. Excellence matters. You might be wondering what excellence looks like in the Sunday School. I’d like to first suggest a definition of excellence that goes like this: “Excellence is an attention to the detail.” Think about that for a moment. If you pay attention to details, excellence must happen. Excellence is in the small things. Take care of those and you’ll be an excellent Sunday School. Wear name tags – If David Francis is reading this, he’s probably smiling about right now. David (Director of Sunday School for LifeWay Christian Resources) is a big proponent of using nametags in Sunday School. I am, too. Nametags help people get to know one another, and they “level the playing field” so that guests look like everyone else. There’s nothing worse than visiting a Sunday School class and not being given a nametag while the members proudly wear theirs. Think this doesn’t happen? It’s happened to me numerous times as my wife and I have been searching for a new church home! Have plenty of chairs – nothing says “we didn’t plan on you being here” more than a group not having enough chairs for members and guests. Talk about awkward! Provide guests with learner books – What a low-cost way to invite a guest back to your Sunday School class! Give each guest their own copy of the learner book your class uses and build an expectation that guests will return the next Sunday. Use a variety of teaching methods – If your learners know what’s coming, it’s time to throw out your playbook and get a new one. Move beyond lecture and use other teaching methods to help learners actively engage in Bible study. Clear signage – Be sure that your classroom is easily identified from the hallway. Start and end on time – It may seem insignificant, but it’s important to be respectful of people’s time. Watch the clock and manage your time in class. Again, these are small things, but excellence is in the details. Think about even more ways you can create a culture of “All horses jump, no chipped paint” in your Sunday School. Post your ideas here for others to learn from! My next post is going to be a very special one on the I-Factor and the power of one…watch for it in a few days! Next Have you seen the LifeSpan video? Is this your Sunday School? !